ROTH. 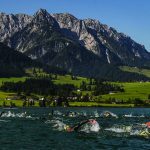 Following athlete feedback, DATEV Challenge Roth’s new run course will feature some changes for 2018 as the event celebrate 35 Years of Triathlon in Roth. The 2018 course will combine the best of the old, traditional course with the new course introduced in 2017. The 2018 course is one-lap with only 160 instead of 330 vertical metres. As previously, the new course heads from Transition Zone 2 to the Roth Canal, through the industrial area before branching off south to the first turn around at Eckersmühlen lock. From there it heads back to Roth industrial area and continues north to the Leerstetten lock (turning point 2), then along the canal back to Roth. After a short loop on the Alte Allersberger road, the athletes run through Rothgrund to the Roth town centre. Then, as in 2017, it’s off to Büchenbach before heading back to the centre of Roth and finally to the finish line stadium. With this course, TEAMCHALLENGE combines all the advantages of the previous two courses. The result is a run which is almost as flat as the traditional course with only 160 meters of altitude, but which offers athletes more safety and a higher level of running comfort with less crowding on the canal. Another advantage is that the elimination of last year’s two-way track, again, relieving congestion. But it’s important to note the spectator experience that was so universally welcomed in 2017 is not compromised. 17 hotspots along the course remain with plans to add new ones. The significantly reduced elevation, along with the fast running surface will make the athletes happy. Feedback after the 2017 race from the athletes indicated they found the double trip to Büchenbach very demanding, but they really enjoyed the amazing atmosphere at the hot spot there and the general spectator-friendliness of the course. From Transition Zone 2 to Gartenstraße / ACUNA practice clinic as before (500 meters). Unchanged via Espaner Berg, past the WÜST hot spot in front of Nüssli to Kanal-Lände and continue Speck hot spot, then branch off to the right along the canal to the Eckersmühlen lock to the outskirts of Haimpfarrich. The first turn around is directly in front of the lock wall at 8km. Via Speck Pumpen back towards Rothgrund, first straight ahead into the Alte Al-Lersberger Straße. From there you continue to the WÜST-Hotspot and Espaner Berg and back to Roth, then on the Gartenstraße turn left into the Mühlgasse and continue to the right to the Sparkasse. Now heading towards Pfaffenhofen, after “Blumen Basso” turn left into Sandgasse. Straight on to the end of the road, cross over the Rednitz Rive towards the sewage treatment plant. From there follow the road to Büchenbach. There turn right from Gartenstraße into the street “Am Espan” and as before to the finish in the finish line stadium (900 meters). The new course is flat except for a rise just before Büchenbach and the recent addition towards Lände and is completely on paved, closed roads. Only (as before) the short wooded area to Lände and the short stretch of the canal is run on gravel paths. 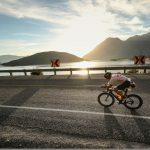 While the 2017 course was designed as a two-lap course and so all climbs had to be tackled twice, the new route is designed as a one-lap course, so that instead of about 330m of vertical gain in 2017 there is now only about 160m.